What is the best pedal tour? When the boss pays for it! 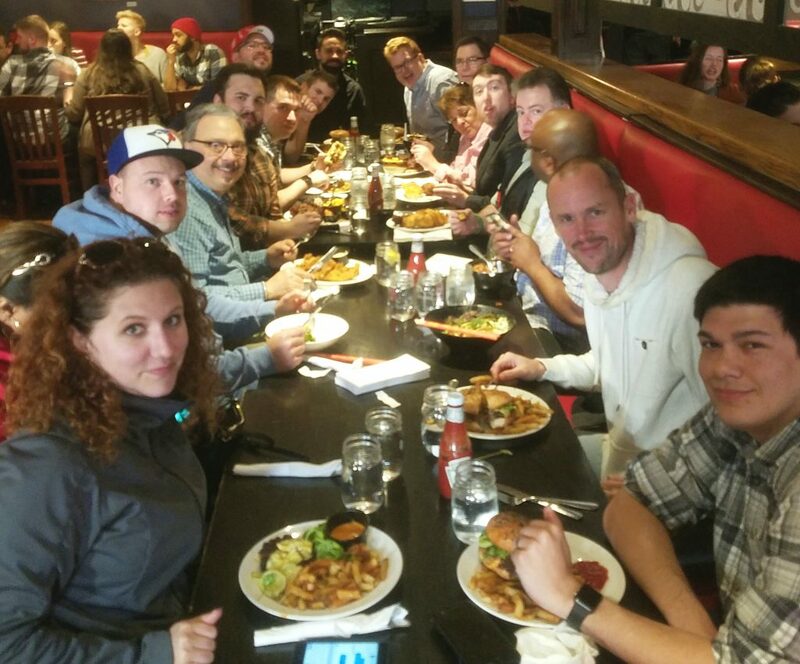 We offer a amazing opportunity to bring the office together for a event that will promote camaraderie and bring your employees closer together. We offer an array of options to fit your offices needs depending on your alcohol policy. All company’s have different policies and we offer something different for each that everyone will LOVE. From big corporations to small businesses we have done team building events for them all. From all these tours we have seen some awesome stuff we encourage groups to do like have everyone pick out a song to put on a playlist for the group and then everyone tries to guess whos favorite song just played. We also encourage you to bring a banner or sign with your companies name on it to hold for all the photos your driver will take of your group on your organizers phone. 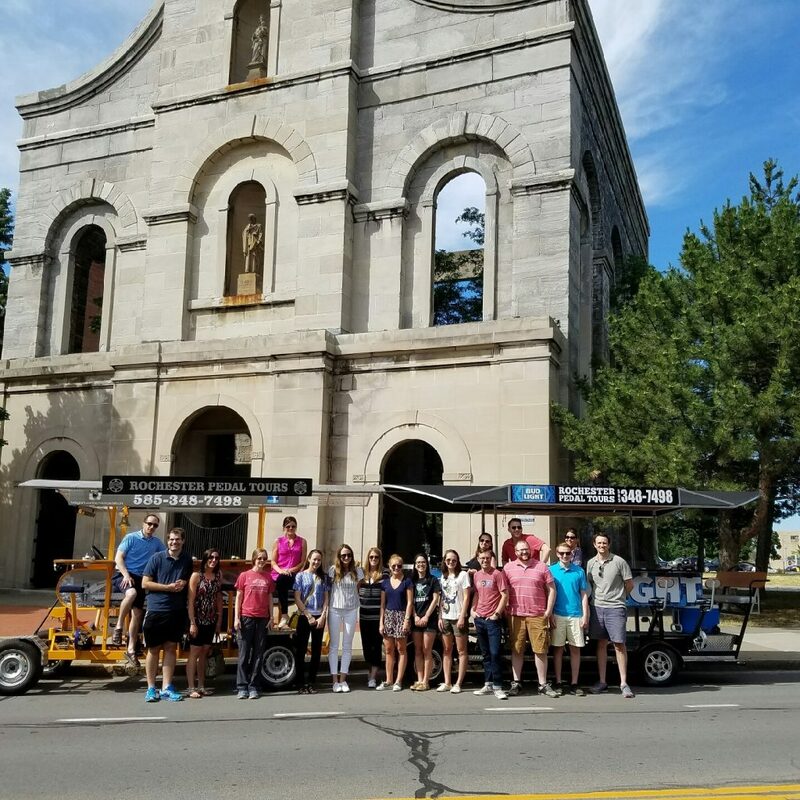 The different types of tours include architecture/history tours, progressive dinners and bar/brewery tours. With 4 bikes not only do we have better availability but we can accommodate groups of up to 54 people!!! We have 3-13 seat bikes and 1-15 seater that can be rented simultaneously for larger groups. We also offer an 18 person cycle boat and a 12 person floating hawaii tiki bar. Both which begin and end at the Port of Rochester complex in Charlotte and take groups up and down the Genesse River. 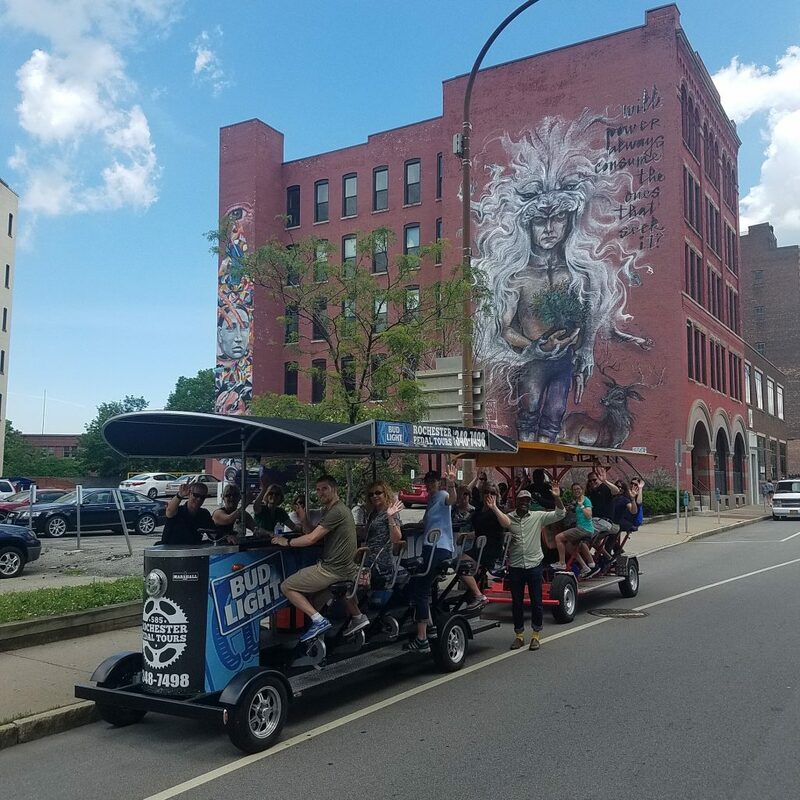 Our architecture/history tours are by far our most common corporate team building event and 90% of the tours bring a can of beer/wine for the riders to have while they travel around the city seeing all the amazing sites Rochester has to offer. You can bring your own food or snacks or pre order food at Dinosaur BBQ. We stop at 6 different sites where the group gets off the bike and your driver who also doubles up as your tour guide presents about the area and takes a great group photo at each place… then we pedal to the next stop with your group playing whatever music they want to off our bluetooth enabled speaker. We offer tour start times of 11am, 1, 3:30, 6, 8:30 to pick between but we can also start earlier in the morning upon request. We do tours year round with a great winter rate, between the pedaling, dressing right and drinking you will be more than warm enough. For 2 hours on a weekday it is $285 (tax is included in that number, tip for the driver is not) weekends are $350. You will see the driver does a lot more then just get the group from point A to point B, one of the big things is taking amazing group photos on the organizers phone for them to send out to everyone. 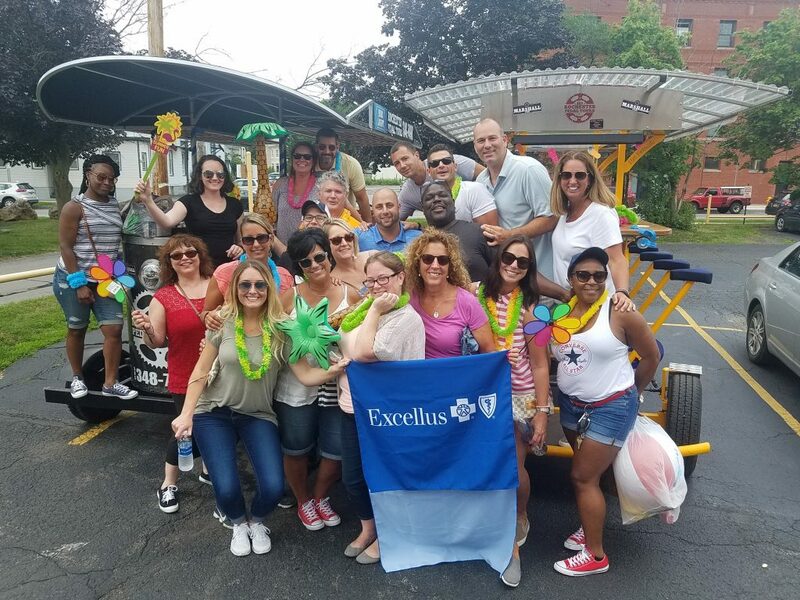 Cycle Boat and Tiki Tours take groups partying on the Genesse River. 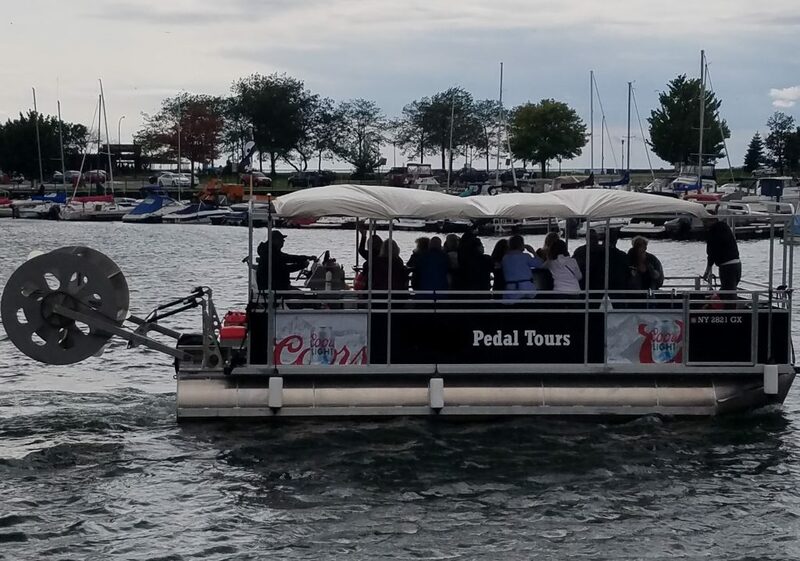 With the bikes we sell you on a bar hopping experience, with the boats we are selling you on a party boat with the potential to stop at one bar. Potentially you may be able to stop at one bar if there is dockspace but with the boats we allow you to bring more beer, wine, cider, sparkling seltzers, mikes hard lemonade type drinks because you are mostly just partying on the boat. We encourage you to bring all types of food, snacks, appetizers and candy. The boats have bluetooth speakers for someone to play via their phone. We of course do all the driving. If you want a longer route then you can do ROC Brewing/Ox and Stone/Old Toad/Lanai/Daily Refresher/Murphy’s Law/City Grill/ Brass then head off to Unter Biergarten/Temple/Salingers ->Richmonds/Joeys/East End Tavern. Half Pint to Strathallan Rooftop Bar to either City Grill/Daily Refresher/Lanai/Old Toad.